I was lucky enough to be selected as a Minnesota ‘delegate’ to the International Slow Food Convivium in Turin Italy. Thousands of other delegates as well as farmers, producers, chefs, vintners and foodies converged on the old Olympic oval in the end of October. Below is a link to my first summary of my experience there. Look for future posts about how I am using the interesting ingredients I returned home with! Every year I go though the dilemma of whether to spend time putting tomatoes by, or to just eat them up. Well, here I am again having that same conversation with myself. 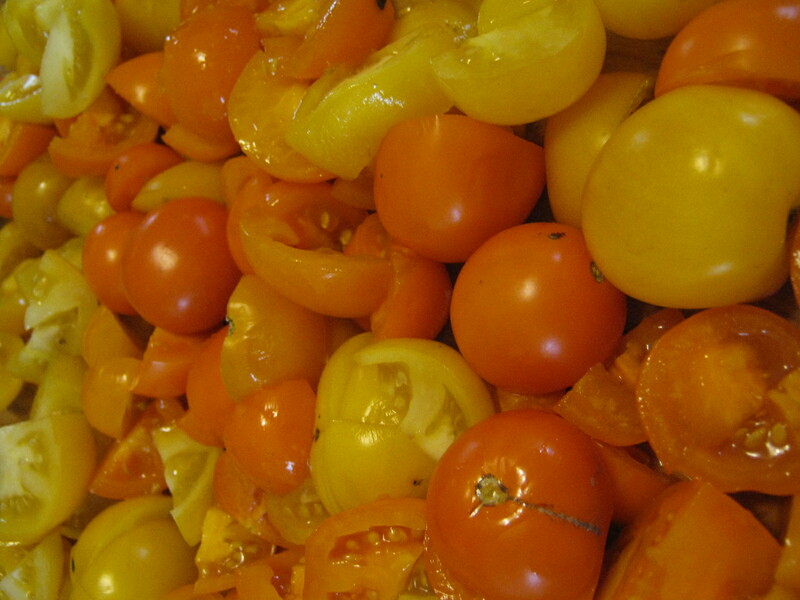 I have a load of tomatoes I rescued just before our first freeze…now what to do with them? I have been lucky enough to be teaching this fantastic class at the University of Minnesota: Cooking from a Food Systems Perspective. We are learning a lot about our place in the food system, and also about how to be a more ‘responsible’ consumer, which I believe includes cooking seasonal food. In the last two weeks, we have pickled, frozen, canned and prepared excellent long lasting items out of our very local (straight from Cornercopia, the student organic farm on the St Paul campus) ingredients. While I’d love to ramble on about all the delicious things we did, and all the fun we had doing it, instead I will simply pass along this one, delicious and simple recipe for tomato jam. This is not jam in the traditional sense of fruit, sugar and pectin. 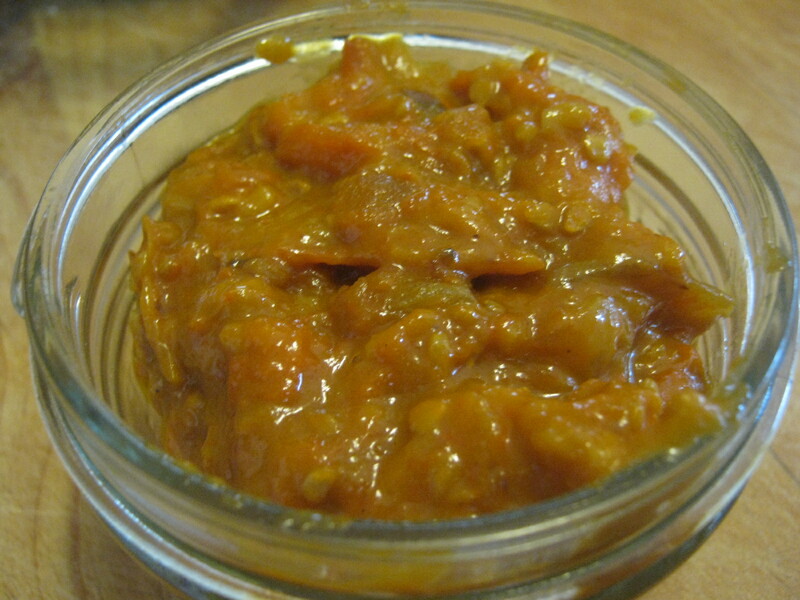 Rather it is a basic cooked down, flavorful spread-more like fancy catsup. And boy is it yummy! 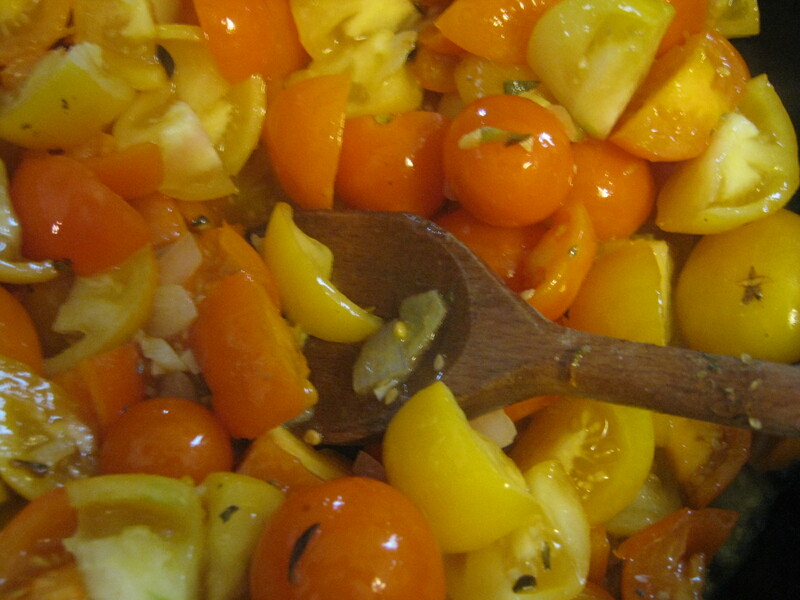 I prepared this latest version with gorgeous small yellow and orange tomatoes leftover from class. As I said, it is easy, yummy and makes everyone, grown ups and kids, happy. See what you think. Oh, and make a lot, this stuff disappears fast! Heat oil and sauté onion, garlic, ginger and jalapeno for about 3 minutes. 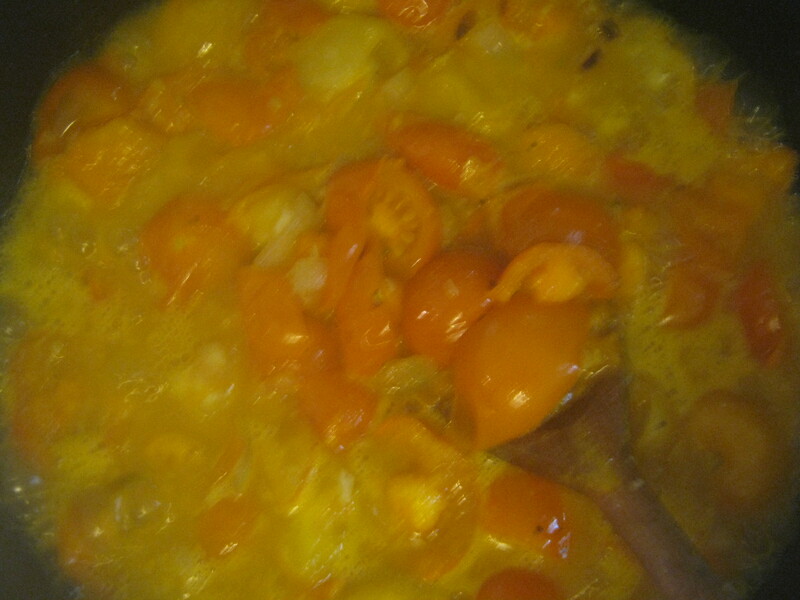 Add tomatoes, syrup and salt and simmer on very low heat until quite thick, about 30 to 40 minutes. Let it cool, for at least 2 hours or overnight in the refrigerator if possible. When the jam is cool, spoon onto cut polenta. To dress this dish up, top each piece with a small dollop of chevré or other strong, soft cheese. My mom is out of town this Rosh Hashanah, and aside from missing her motherly presence, we were also missing some guaranteed staples at our Jewish New Years table. I was given the task of providing the carrot ring, or “something like it” for our holiday meal. 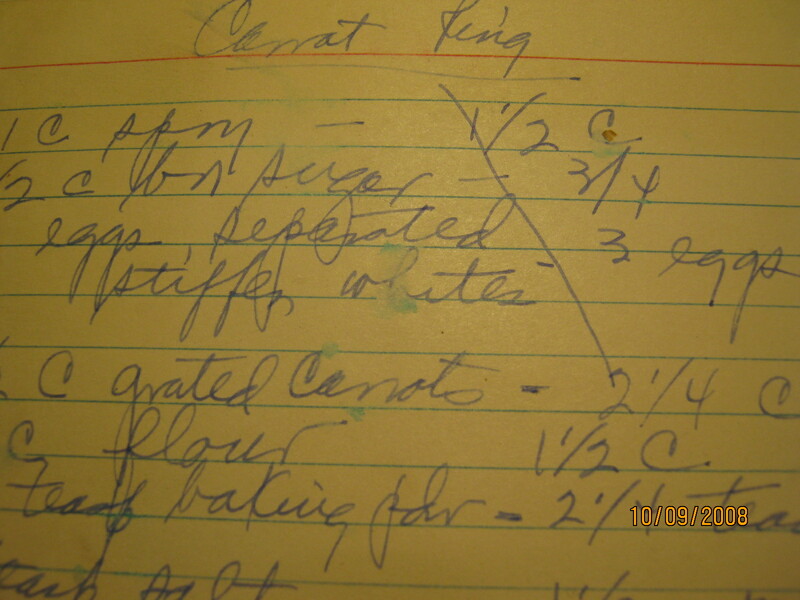 Carrot ring is the closest thing to cake for dinner that I have ever had, but apparently it is not a tradition in all Jewish homes OR in Jewish cookbooks. I searched to no avail through all the Jewish cookbooks in my collection. Luckily, I have in my possession 4 envelopes containing the handwritten recipes of my great Aunt Tillie, who passed away close to 20 years ago. Admittedly, most of her recipes are not exactly my style of cooking, so while I keep them safely in a drawer, I don’t pull them out often. This however turned out to be the perfect opportunity to investigate the envelope labeled “CARROTS-NOODLES-SALADS-JELLO-MOLDS”. To my great pleasure, I came across exactly what I was searching for! The recipe required only one adaptation-instead of “Spry” (a vegetable shortening created in 1936 which rivaled Crisco until the 1950’s), I used butter. Actual instructions were minimal, but clear enough that I followed along with relative ease. The real treat was flipping through the yellowing recipe cards holding some of the only remnants of Aunt Tillie in her flowing blue ballpoint cursive. Some cards contain newspaper cutouts with ads for things like ” 2 bottles of catsup for 29 cents”, evidence of bygone days and a different era of food altogether. While I am not likely to use many of the recipes very often (there are probably as many that call for canned fruits and frozen vegetables as for fresh), I am thrilled to have this piece of the past and the opportunity to bring a little traditional flavor baked up with some sweet memories into our family celebrations. The preparation was quick, and the result was a lovely, fluffy, and tasty bread like dish. While it could not replace mom’s (or Aunt Tillie’s) presence at the New Years gathering, it was the next best thing. Combine dry ingredients and set aside. 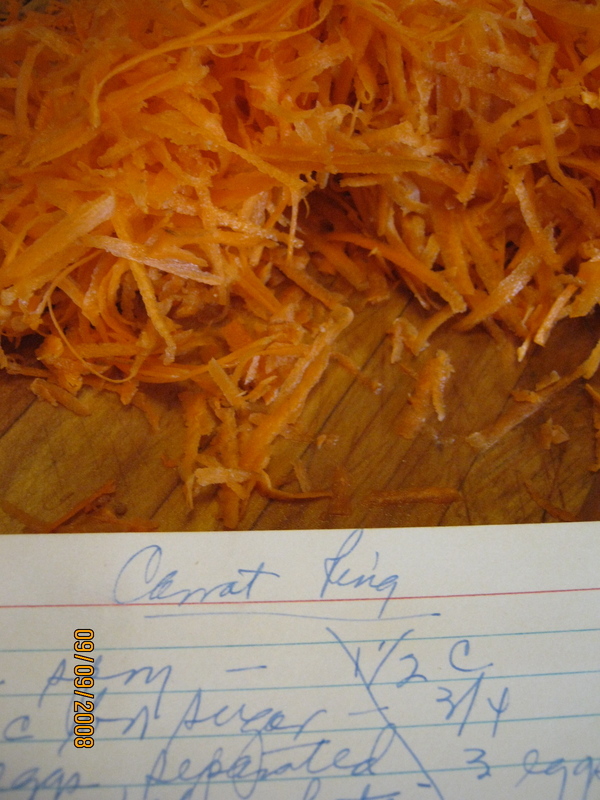 Cream butter and sugar, add grated carrots. Then add dry ingredients, lemon juice, and stiffened egg whites. We have been home now for almost 8 weeks. A lifetime in some ways, and in others just a moment. I hit the ground running, jumping right into all the exciting food and food systems work happening in Minnesota. I found that the activism around food, justice and sustainability is even bigger and wider than when I left. It continues to give me great appreciation for what a progressive, aware, and rich community we live in. I feel lucky to be a part of this incredible movement, especially when I know that in many parts of the world such luxuries are distant dreams, if anyone thinks about them at all. At the very same time, I am thoroughly enjoying this beautiful, and bountiful fall in Minnesota! The gigantic greens, juicy tomatoes, vibrant squash and extraordinary cheeses are keeping me busy in the kitchen. I will continue to design delicious meals, and offer stories and recipes, but I also hope to bring insight, exposure and hopefully connections to our growing, and diverse food community. We have much to learn from one another, I am ready to stir the pot. Speaking of cooking….Tuesday was a scorcher. 90 plus degrees thickly hanging in the September air. It was most definitely a cold food evening, and I happily combined every Minnesota ingredient I had into 3 flavorful, colorful and COLD bowls of yumminess. 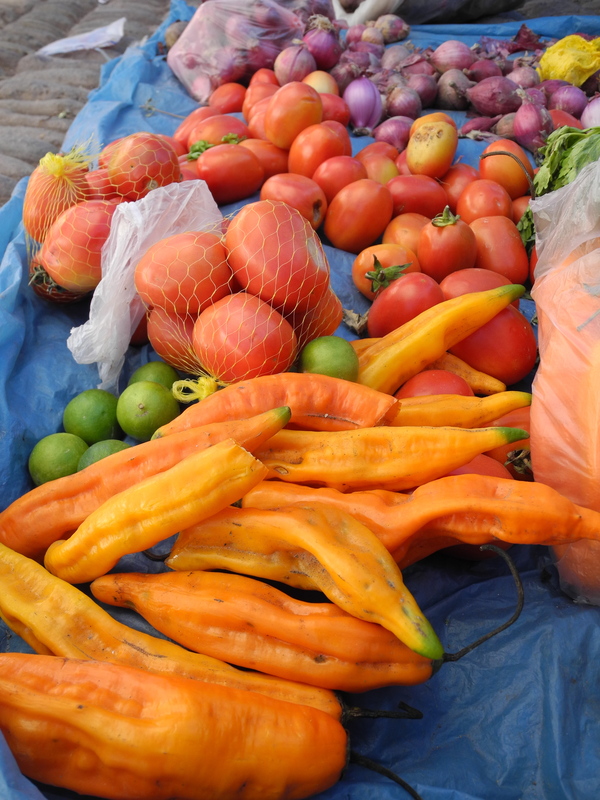 Every vegetable in every dish was a local ingredient. I LOVE this time of year when it is possible to do this. 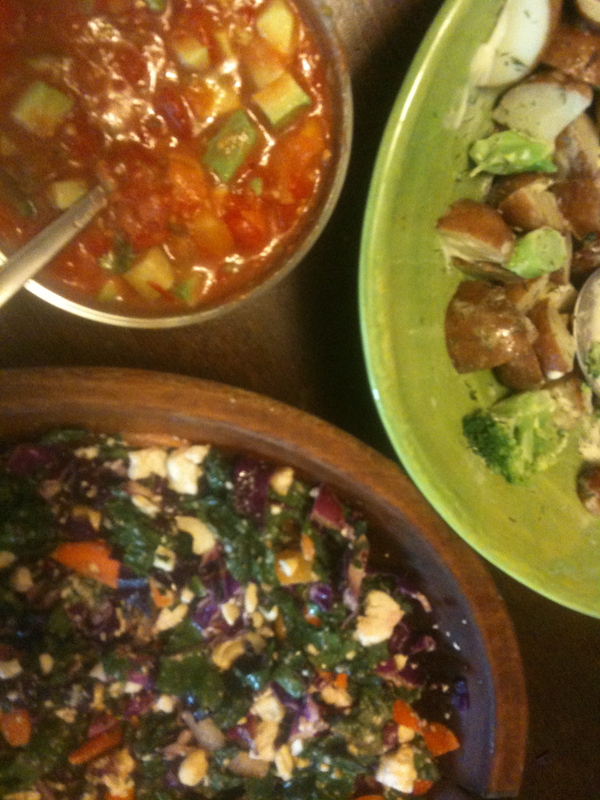 I made a simple salsa (OK, it had avocado), a potato and broccoli salad with fresh dill, and finally, a Russian kale, cabbage, carrot, sungold cherry tomato and feta salad with just a hint of toasted sesame oil and maple syrup. That one really knocked my socks off. We just returned from our year of life and adventure in South America. For the last 6 weeks we were traveling around La Paz, Bolivia, and throughout the Sacred Valley in Cuzco, Peru. There is so much to say about food, and culture in this part of the world, it will take many posts, recipes and stories to cover it all. Here is my first attempt…. 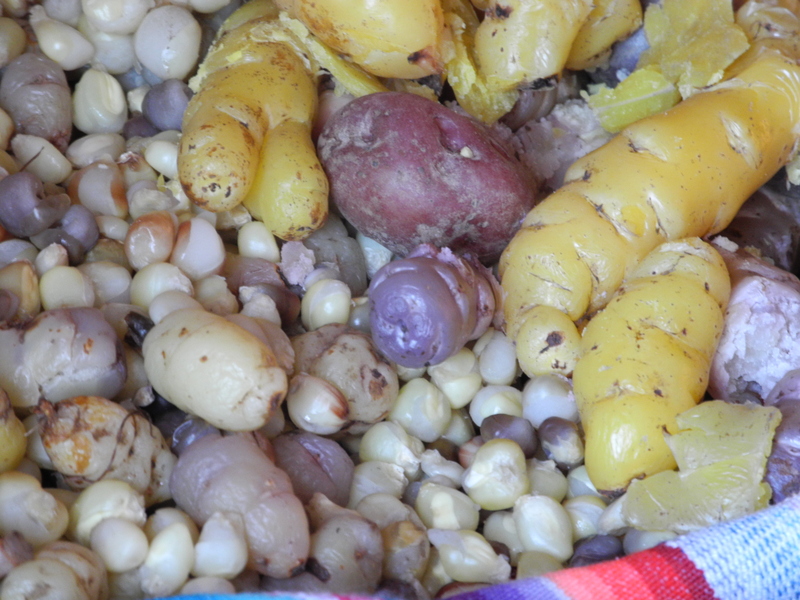 It would be impossible to talk about Bolivia and Peru, without talking about potatoes and corn. I LOVE these two starchy vegetables and generally eat them with glee. However, there is a blessing and and a curse to these varied and colorful carbohydrates. They offer sustenance, texture, color and a blank canvas upon which to build delicious and filling meals. On the other hand, they lack the nutritional complexity and variety to sustain healthy bodies, teeth and land for the larger community, yet they provide the bulk of calories for many people in these two countries. The impressive size of the Andes is clear upon arriving to a city like La Paz, whose million plus people sit nestled in the base of a bowl below a circle of 4, 5 and 6 thousand meter peaks. 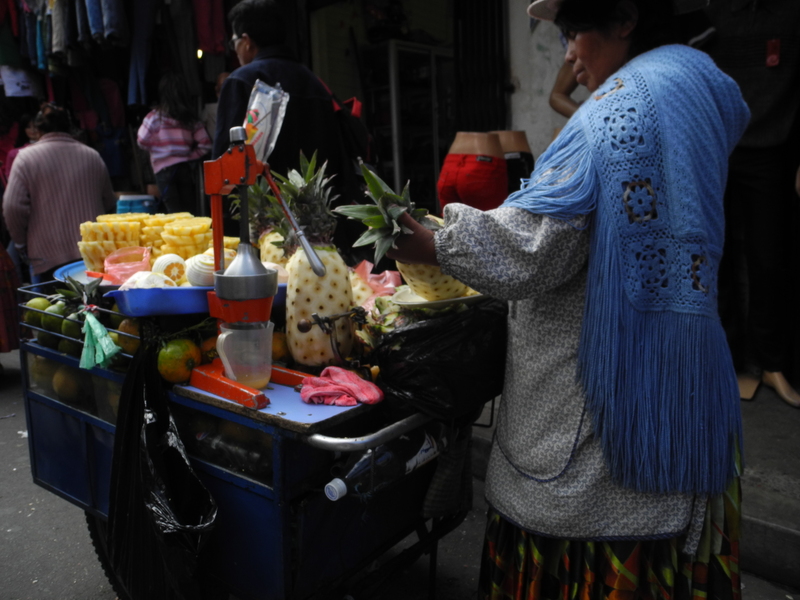 What is also clear is that many of the inhabitants of La Paz, and the surrounding countryside make their living selling any number of things in the streets. Each morning this city begins to awaken with the hustle of people pushing, pulling or hauling on their backs bags often two or three times their size, full of food products. These products range from potatoes and corn, to other vegetables, citrus fruits, peanuts and peanut products, or a ubiquitous snack made of sweetened, puffed wheat, corn or pasta. 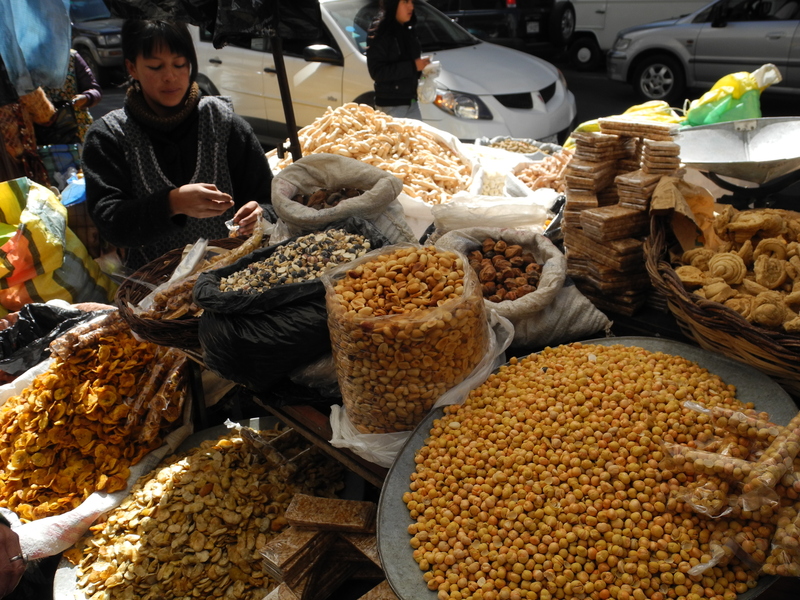 By 9 AM, the streets are loaded with vendors spilling out over the sidewalk and onto the streets making it almost impossible to walk without stepping in front of a mini van full of passengers. The visual experience of this chaos is stunning. 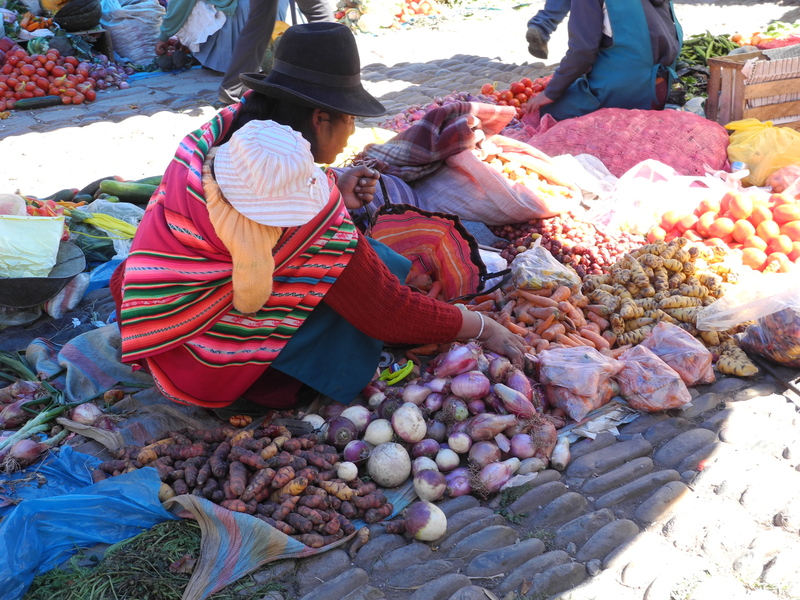 Most of the food vendors are indigenous women, (about 50% of the population of both Bolivia and Peru are indigenous) sporting the colorful and elaborate costumes, braids and bowler hats of their tradition, and the colorful cloth tied across their backs, frequently holding a baby. They also often wear a very serious expression betraying the challenge and hard work of their daily lives. The juxtaposition is at once fascinating, and sad, offering a sort of time warp between old and new, modern and traditional. 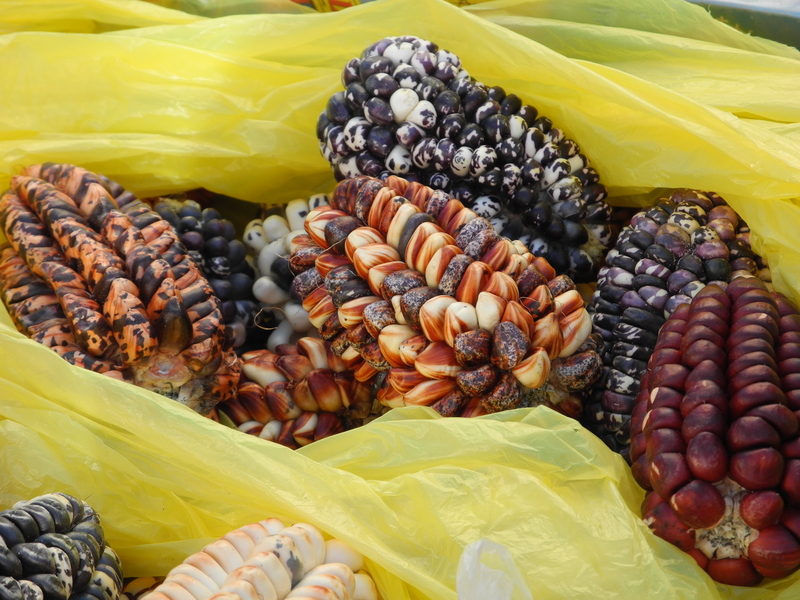 As for the diet, for better or worse, the potatoes and corn have maintained their place at the center of the Andean plate. 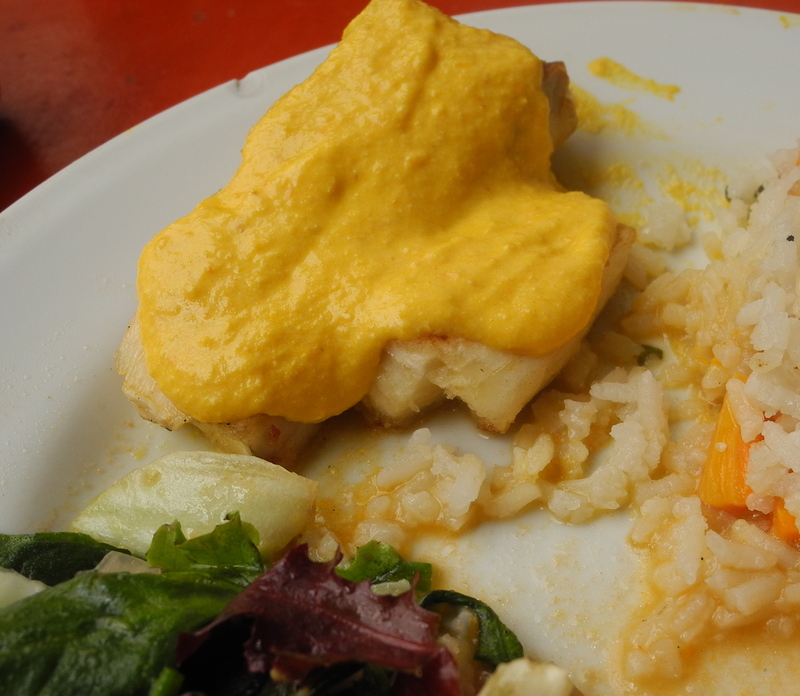 This has provided for the development of classic regional cuisine, representing some of the most commonly available foods together in dishes such as papas a la huancaina, Peruvian potatoes with a bright yellow sauce made of aji, the traditional vibrant orange Peruvian pepper, and fresh local cheese. The saltine crackers are a surprising, but crucial ingredient as they add a subtle salty and starchy finish that brings a different character to the sauce. Cut the cheese into cubes, blend in blender or food processor with the peppers and milk. Then add turmeric if desired. Add vegetable oil slowly. Add the crackers and salt last, and blend until well combined. If sauce is slightly thick, add a spoonful more of the oil, and if it is thin add an extra cracker. You can also adjust the heat by using half spicy pepper and half sweet pepper. The sauce is traditionally served over boiled quartered potatoes and hard boiled eggs on a bed of lettuce and garnished with black olives. It also makes an interesting dip for vegetables, and I had a lovely variation with Yucca in place of potatoes. No, I´m not talking about my kids….I´m the one who lost it the other day, and yes, it was about lunch! We have been traveling in Bolivia and Peru for just over a month. We have seen incredible sights, met interesting and lovely people, slept in many different places, and eaten out every day, sometimes 3 times. Heavenly right? Hasn´t everyone dreamed of this luxury? No need to shop, cook or wash dishes. Simply sit down, make a choice, and viola, the meal appears. Here´s the thing. I LOVE to cook. Every day, I think about my next meal….what I crave, what I need, and what is available. I often go to sleep planning tomorrow´s scones, or creating my shopping list for the week of meals. I relish the opportunity to use a local cheese, a seasonal vegetable, a favorite whole grain, or tasty nut in a compelling new flavor combination, or even in an old stand by. I barely finish one meal before I am thinking about the next. I know my body, my rythm; these thoughts, these feelings are my constant companion. And the truth is, I like my routine. I miss my routine. It doesn´t help that here, in this part of the world, and at this time of year, people eat copious amounts of potatoes, corn and white rice. While I love the more colorful varieties, they are starting to make me feel sluggish. Yesterday, I just wanted simple, green food. Salad, broccoli, brown rice kind of food, I wanted it NOW, and I didn´t want to worry about what anyone else was eating but me. Simple, maybe, but within minutes I was in tears! (and not long after, so were my kids). In any case, I had to let go and feel the sadness. The joy and nourishment that comes when you have a relationship with your food is life sustaining. While I am incredibly lucky to have the means to travel, and feed myself and my family, there is really nothing like getting messy making simple food, fresh from the source, and then sitting down to eat it. I got some vegetables, and they were green, and tasty, but my heart is still waiting to get back into the kitchen.